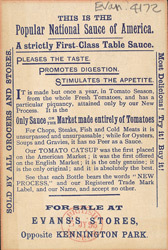 This leaflet is advertising Gordon and Dilworth's Catsup. The origins of tomato ketchup can be found in a Chinese sauce named ‘koe-chiap’ or ‘ketsiap’ that was created from pickled fish. British and Dutch sailors brought the sauce back with them in the 1600s. There have been many different varieties of ketchup made from vegetables such as mushrooms, cucumbers and cranberries. Initially it was a different texture, it was much thinner and was more like soy sauce. In the 1830s American tomato chutney was introduced to Britain and slowly developed into the ketchup we know. Catsup and catchup are acceptable spellings used interchangeably with ketchup, but ketchup is the most frequently used today.